The other week, I bought a Twangoo (another version of Groupon) with a few girlfriends to take a flower arranging class. The class was a lot of fun, who knew that flower arranging can feel so productive yet tranquilizing? It was surprisingly easy. 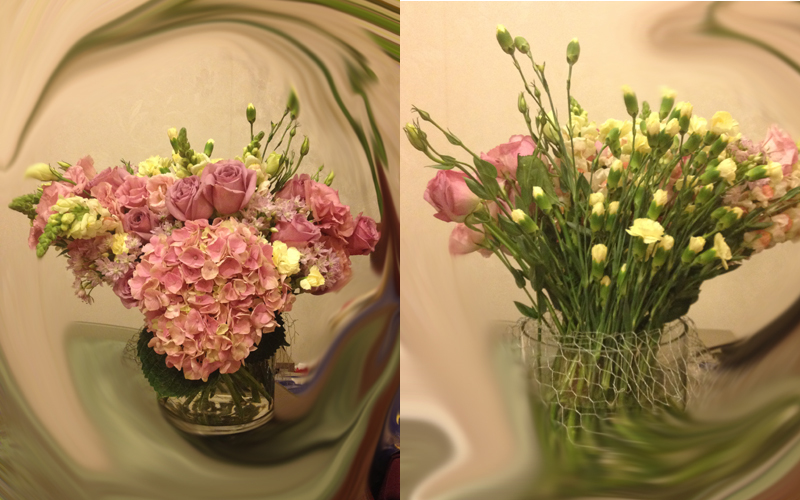 You put a metal grid net on top of the vase, cut and arrange the flowers such that you create a dome shape. Just fill in the holes. I can definitely do this at home! Or so I thought. Come Saturday, having mentally prepared to go to the flower market in Mongkok all week to select flowers and arrange them at home, I wasn’t going to let a little rain stop me from going. I put on my trusted violet Hunter rainboots and headed off with my boyfriend in tow. Five stops away on the ‘other’ island, it was quite a journey for us HK islanders. The weather proved stronger than my stubborn streak. As soon as we arrived, it started to pour hotdogs. Not to let it put a damper on my mission, my Hunter and I ploughed on, with my poor boyfriend trailing behind in his flip flops trying to walk around the puddles (My Hunters were awesome!). We finally ended up with a pair of flower scissors, a metal net (after over asking over 10 stores!) 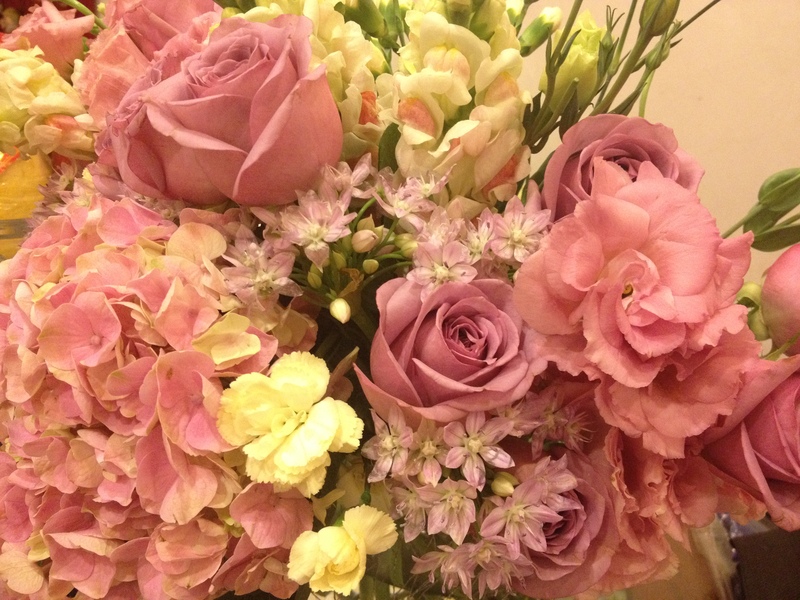 and a bouquet of gorgeous flowers. Hydrangeas, roses and a bunch of other flowers that I cannot name. It was super fun picking them out! After a long journey home, I immediately got to work arranging the flowers. After 20 minutes, I knew something was wrong. I was almost done with most of my flowers, and there were gaping holes everywhere! I ended up with the above arrangement in the end. Not exactly dome shape, I like to think of it as an artistic and deliberate triangular arrangement. The back however, is another story. I figured instead of having patches of baldness, better to have a good front! I definitely need more lessons before I start DIY-ing again. In my defense, I later found out from my mom that I’d been using the wrong vase with a wider diameter, which partially explains for gaping holes.